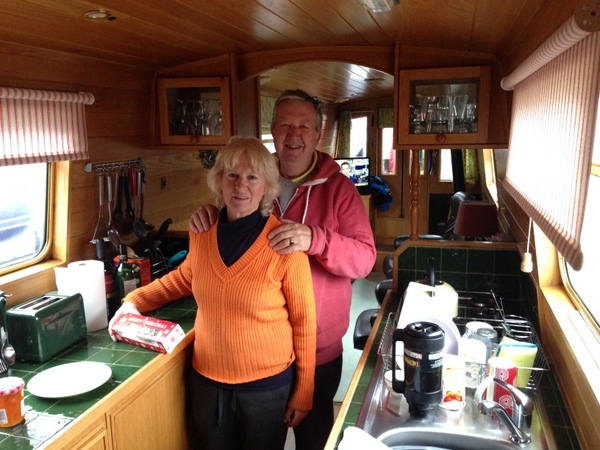 After forty years of working in the USA and South Africa, John and Brenda Rogers purchased a narrowboat rather than a much more expensive house then set off to continuously cruise the inland waterways network. My name is John Rogers and my lady wife is Brenda, we have two dogs Rosie a 12 year old Border Collie Tri-Colour and Pip a 10 year old Rough Collie (Lassie Dog), we are both into our retirement years but young at heart and also young in attitude and body both still very active. We have spent the last 40 odd years living in the US, then South Africa then France. The US and South Africa were career moves (actually I was transferred to the US from the European Head Office then to South Africa to help our distributors establish a stronger market share especially with new products. In 1964 I joined IBM and have spent the next 40 years in IT directly related roles, primarily marketing related for the last 20. Then I moved into general business management, in the end moving into renewable energies. Then during Christmas 2013 my wife’s niece who lives in Basle in Switzerland said that a friend of hers was being transferred to the US and had a house just over the border in France wanted a House Sitter. Brenda was really quite homesick and we always intended to come back to the UK so this was a fairly cost effective way of getting back to Europe and being close to our sons who also live in Switzerland. This was a great opportunity to be a springboard back to the UK and gave us time with them and our grandchildren so we immediately decided to take the jump. This amazed our niece as we during the phone conversation said YES. One big challenge we had was the value of the South African Rand compared to the Pound so we knew we would have quite high challenges to find a house we wanted in our price range. Also, as we hadn’t been here very often over the previous 50 years we also wanted to see more of the UK before we decided where to settle done. 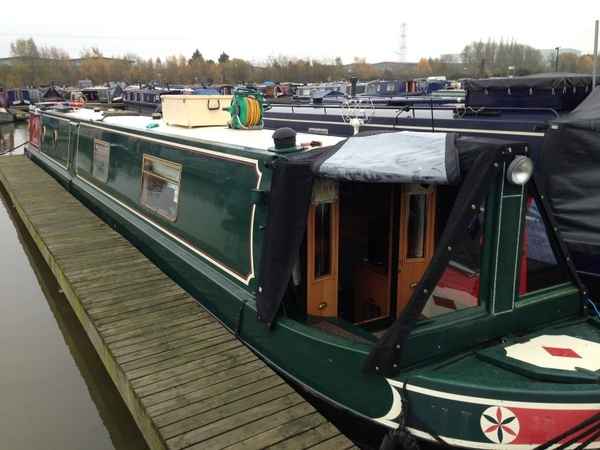 An option we always considered was a Narrowboat. While the living costs aren’t any cheaper than living in a house, the purchase price was markedly less so we started looking for a boat in the autumn of 2013. Our Boat is “The Lady C”, and we inherited the name but quite like it, nothing to do with our recollections of D H Lawrence. No, we purchased the boat thru ABNB at Crick so moored there for a couple of months while we got used to life aboard. We actually moved onto the boat from France in May of 2014, so had the benefit of stunning weather for our indoctrination. The Lady C is our first boat, but I have been on them before on holidays with my parents also quite au fait with boating in general with yachts etc. We were lucky enough to be able to pay cash from our savings and pension nest eggs. We are currently among the jolly band of Live Aboard Continuous Cruisers, so on board all the time. Not yet but would really like to be able to use my IT experience especially with Microsoft Office products to help others build presentations, business plans with Word and Excel as this was my particular strength in the US and South Africa. Probably the lack of space, which isn’t helped by having two dogs, if we end up staying afloat we would most likely go for a Widebeam. The freedom (especially when cruising) and the ability to be independent of all. Probably have a semi trad or cruiser to give space at the back while cruising so it would be easier for us both to experience the glories of the countryside OR change the kitchen to be a U shape, currently we have units each side so walking past each other when one of us is in the Kitchen makes the lack of space more evident. We have a Candy Washing Machine and a Drier so not a problem, just exacerbates the water situation. Pump out and much prefer it to those folks we see trooping up and down with their slopping cassettes. We have been quite lucky in this regard, we first asked (on your blogs) which provider we should opt for and went for “3”, unfortunately Crick is one of their weakest areas so initially is was difficult, then I purchased a signal booster, and since then that combined with their MiFi unit we have had god or great reception at least 95% of the time. Tough question, we have cruised extensively over the last 4 months, covering The GUC Leicester line, the GU up to Coventry, then the Coventry, on to the Ashby, then the T&M up to the Macclesfield including the Cauldon then up across through the Cheshire locks to the Shroppie and back along the Warks to the GUC then back along the T&M to Barton Turns for our wintering. Given all of this we probably would vote for the Ashby. When we were cruising we used about 5 pounds of diesel per day on average and that covered our cruising and power needs, if we stayed in one place then we ran the motor for about 3 hours which gave us enough power for our basic needs, lighting, television, fridge (12 v). We have Diesel Central Heating that we didn’t really need too often. At the Marina for Winter we are using about 0.46 pounds a day for our electricity, not yet sure how much diesel, but we have a calorifier with three coils so have multiple ways of generating hot water. We are used to the cold, in the States we used to sleep with our windows open and the year we left (1994) it never rose above zero day or night from late December until early March so quite hardy souls Too warm, as yet we haven’t fired up the Morso Squirrel and turn on the central heating several times a day to top up the warmth. Make sure you can live without life’s luxuries most of the time and are happy with your own company, especially if planning to be continuous cruisers. You also need to be quite practical as you will most likely have to some general maintenance.